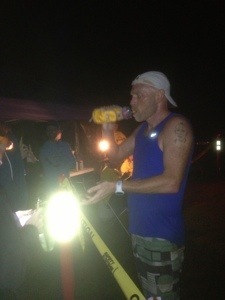 Michael is holding on to first place completing 3 laps in 1 hr 53 min. He’s keeping a great pace and enjoying all the support he has for this race. Cheeeeeeehoooooo! Go! Michael!!! I was patiently waiting for a new status. So proud! Mahalos TG. Thanks for staying up all night right along with the crew at the course. See you soon! Awesome! Keep up the good work Michael!